Summary: Turn your car radio into a hands free phone. It uses your radio as a headset. No wires, no installation. Easy to use. State laws prohibits you to talk on your phone while you drive or it's just very risky unless you use a handsfree headset. But do you find yourself always forgetting to bring it with you or forgetting to take it out of your bag when you drive and then a phone call comes in that leaves you scrambling to find it? Then you need the JupiterJack. Leave it in your car and it's always ready to pick up any phone calls in your car. The JupiterJack is the most convenient handsfree device for any cellphone. 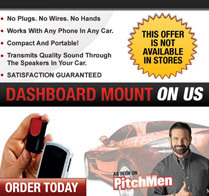 Just plug it into any phone and mount it to your dashboard (free dashboard mount included). Then turn your radio to 99.3FM and that's it! The conversation now comes through your car speakers. No more holding your phone while you drive. You'll be using your cellphone safely and legally. Safely talk and drive. It's compact and portable. Works with any cellphone. It's much safer than holding your phone while you drive. The JupiterJack is cheaper than your typical bluetooh headset. “It's so easy, i just plug it into my phone and start talking! And I feel so much safer because I don't have to hold my phone while I drive! 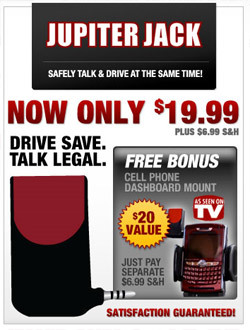 So with the JupiterJack, you only pay $19.99, and as a bonus you'll get a free phone dashboard mount.